ReVision LASIK and Cataract Surgery is proud to support WOSU Public Media’s Ready To Learn (RTL) program. RTL’s first focus is educating adults to help young children develop the skills necessary to begin school by providing free workshops to teachers, caregivers and parents in at-risk communities. ReVision understands the importance of education and technology and is proud to help the RTL Program continue to grow and serve more of those in need. This year, TRL is expanding its outreach to include family and community learning workshops in addition to maintaining a classroom presence. Funds donated by ReVision Gives Back will assist in the purchase of iPads to use in RTL’s Portable Learning Lab. During community workshops, iPad technology helps instructors demonstrate how adults can integrate segments from PBS Kids programs, children’s books and online learning resources to foster childhood learning and development. Each month, up to twelve families residing in targeted Columbus neighborhoods participate in 2-hour weekly workshops. 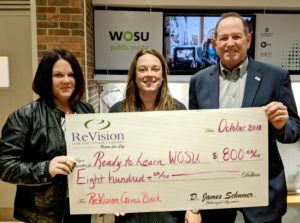 ReVision LASIK and Cataract Surgery is honored to partner with WOSU Public Media and support one of its very deserving programs. The Ready To Learn program is instrumental in educating the educators so they can share the joy and importance of learning with children. When our youth get excited about learning, the sky is the limit and communities prosper. Learn more about WOSU Public Media and the Ready To Learn program.